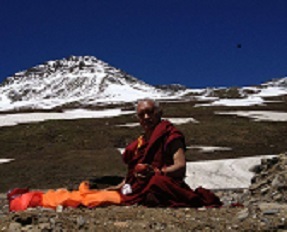 Lama Zopa Rinpoche has just finished retreat in a very holy place in northern India (see photo). Rinpoche is well and next stop is Mongolia for the 100,000,000 mani retreat. I would like to thank everyone very much for all their efforts in helping to do the practices Khadro-la advised us to do for Rinpoche’s health and long life. It is very important for us to continue doing these practices especially at this time when we know there are obstacles for Rinpoche in 2014 and 2015. Khadro-la (Rangjung Neljorma Khadro Namsel Drönme) was very clear for students especially to help by doing as much of the practices as possible. Khadro-la said “The most important is good samaya from the students’ side. Whoever is doing the puja, prayers or practice, it should be done well, with good motivation and meditation”. Rejoice at practices done so far!